Ocean Beach is a massive 3.25 mile stretch of a sandy coastline along the west coast of San Francisco at the Pacific Ocean. 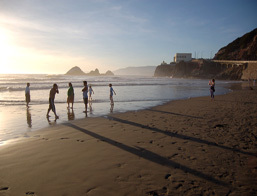 The beach is part of the Golden Gate Nation Recreational Area. To attract visitors, in 1884 the city built its first amusement ride by the ocean side - a "Gravity Railroad roller coaster and the Ocean Beach Pavilion which housed concerts and dances. By 1890, there were trolley lines: ferries, and railroads which encouraged San Francisco to claim Ocean Beach as a commercial amusement development. The Cliff House, a perched restaurant on the headlands just north of Ocean Beach which opened in 1863 and Sutro Baths, a large privately owned swimming pool complex which opened in 1896 drew thousands of visitors. The water at Ocean Beach is known for its heavy waves and strong currents, making it one of the Bay Area's top surfing spots. No more than 30-40 feet from the entrance, there are bonfire pits for public use. On the weekends, you would most likely spot a group of teens roasting marshmallows. Dogs are welcomed and allowed to run freely, but always keep a watch out. This beach is not only teeming, dog friendly, it has spectacular views. Tourists roam the land, taking pictures of the distant ocean water and beautiful scenery. People stroll along the beach just to admire nature or just to take a break from work. Hikers trek the trails leading to breath-taking views from a bird's eye view. On a not-so-foggy day, you may just get lucky and witness a magnificent sunset.